Why do you eat food? For fuel. Food gets digested (hopefully) to allow the mitochondria (the powerhouses of the cells) to produce ATP (Adenosine triphosphate) which is the energy you require to function in life. If you use the energy, like in the case of your daily activities, that is great! You are "spending" this “energy currency” well. If you just go to sleep after eating, because your use of energy drops dramatically during sleep, you don’t have anything to spend this ATP on, you hoard it. Hoarding is never good. Maintenance attracts destruction. The ATP over-accumulates which increases free radicals, reactive oxygen and mitochondrial damage. When you re-establish fat metabolism, you may not even require dinner at all (a healthy habit). But as a culture, we have lost the ability to burn fat for fuel. Instead, we are using sugar as fuel, quick injections of stimulants from all sorts of foods - think organic dark chocolate, organic nuts, raisins, coffee etc. If you are snacking for quick hits of energy this indicates that you have lost the ability to burn your calm and stable source of fuel - fat. Have a phone consultation with me to re-establish fat metabolism. Protein activates an anabolic pathway called mTOR activation - causes you to build muscles. Of course you need mTOR activated but it should not be continuous. The primary problem when you eat a heavy dinner is it suppresses an important metabolic process called autophagy (meaning “self-devouring”), which breaks down, processes cells and disassembles unnecessary or dysfunctional components. If autophagy is impaired, this can cause cancer (excess tissue). Excess protein can increase cancer risk. When a tissue (Dhatu) increases, it can cause tumours. Excess protein in some cases can be even more dangerous than excess glucose. Your agni (digestive fire) is regulated by the sun. When the sun is strongest, ea your biggest meal (lunch). When the sun is down, your digestive strength is low, so eat light. When you sleep on top of a big dinner your heart rate pulse rate, respiratory rate, metabolic rate all slows down which causes food to linger in your system without being digested (ama). You wake up in a state of indigestion with ama deposited somewhere in your body. Then you think that “breakfast is the most important meal of the day” and you put another truckload onto of that. Then you walk around feeling blocked and inflamed. You create vascular inflammation, congestion, your sinuses are blocked, you are barely awake because you are feeling dull and heavy. You don’t even feel the desire to having a big lunch since you are so out of tune. So add massive doses of caffeine to give you energy which suppresses agni, causes improper appetite and further disconnects you from fat metabolism. 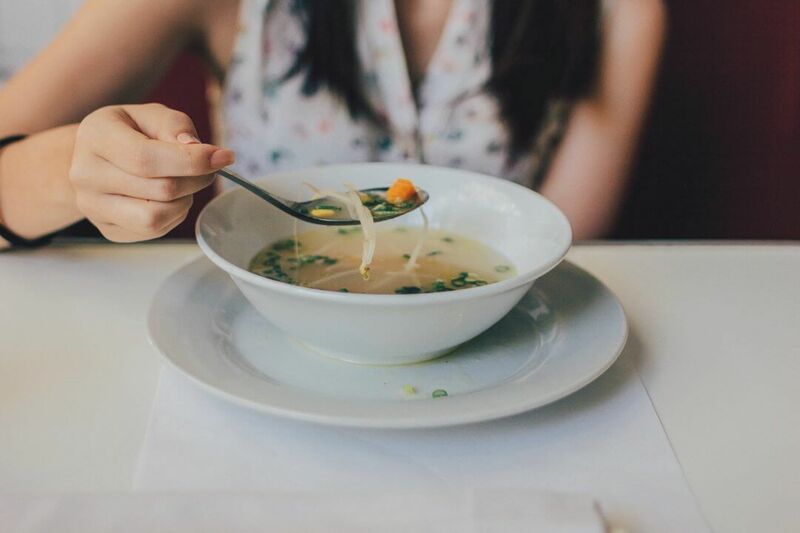 Supper comes from the Old French word souper meaning “evening meal.” That is where we get the name soup from. Supper should be a light supplementary meal, not the main meal. Soup is a great choice. Have a good, solid warm cooked lunch. Eat that in a relaxed manner to be properly nourished and satisfied. Re-establish fat-metabolism by moving towards three meals a day, no snacks. Learn to "wind-down" from your day with techniques like meditation, pranayama and immersing loving relationships. 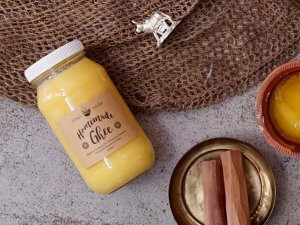 Incorporate healthy fats in your diet such as ghee. Eat whole foods, rather than processed foods. If you eat meat, fish or eggs, only eat at lunchtime. Dinner options: vegetable soup, kitchari, light vegetable dish. Ayurveda stresses the importance of not only What you eat, but perhaps How you eat is more important (unless you are eating crap). Furthermore, you want to have optimum functioning digestion (agni) so that what goes in your mouth becomes a thin fluid essence of nourishment (ahar rasa) rather than a thick toxic congesting fluid (ama). Ideally, you should wake up effortlessly, you should jump out of bed. You should also wake up slightly hungry.